Seascape is a rare find being it’s one of the only Galveston condos on the beach that allows direct beach access. It is located oceanfront right on West Beach, on Galveston’s secluded West End. Seascape’s has a private extended pier that leads its guests directly onto the beach. The grounds have plenty of picnic and grill space. The pool also houses a hot tub and plenty of outdoor lounging space. The Seascape condos have large patios, perfect for sipping your morning coffee or enjoying the gulf breeze. They also have full kitchens so you can cook meals if you get tired of eating out. Though Seascape is on the West End of the island it is still very close to the Seawall and allows for easy commute to shop, dine, chill or explore. There is plenty to see and do all along the Seawall. You can visit The Historic Pleasure Pier, Murdoc’s, 61st Fishing Pier or visit the 1900 Storm Memorial. If you get hungry there are tons of places to grab a bite like: BLVD Seafood, Ocean Grill & Beach Bar or Grotto. You can rent a bike and tour the Seawall, go on an airboat tour, parasailing or even venture out with Dolphin Watch and try to spot the rare pink dolphin. Stock up on candy at downtown Galveston’s La King’s Confectionery or visit Gracie’s a unique Strand shop. If you want to head back to Seascape on the West End, then you can check out Jamaica Beach. There are several places to dine such as Blue Water Grill or stop and get some fried shrimp at the food truck Shrimp n’ Stuff. If you get tired of being outside then checkout Moody Gardens, it’s an adventure in itself. The Aquarium and Paddlewheel boat are a few of the most popular attractions. 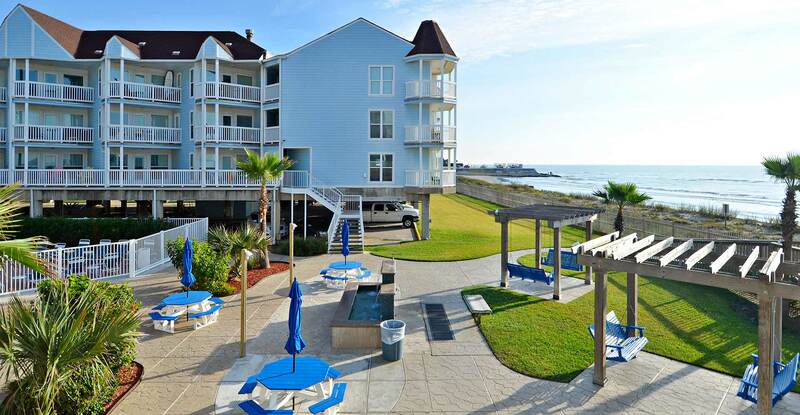 Or, you can simply return to the comfort of these Galveston condos on the beach. Seascape offers a beautiful fun adventure for families, girlfriends having a weekend getaway or a romantic retreat for two. The feel of being right on the beach and the panoramic views are wonderful.